Prosecutors say they have evidence that a former Supreme Court chief justice expressed his opinion about a politically sensitive court ruling on wartime forced labor to a senior judge deliberating the case. 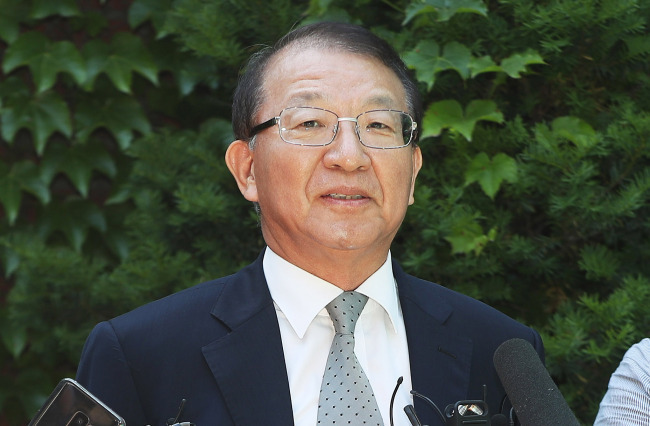 Yang Sung-tae told Kim Yong-deok that a final verdict ordering Mitsubishi Heavy Industries Ltd. to compensate the South Korean victims of forced labor at Mitsubishi during World War II could give rise to an international legal dispute, prosecutors said. Prosecutors see this as proof that Yang interfered with politically sensitive rulings by the top court. Yang has been under investigation over allegations that he sought to use politically sensitive court cases to bargain with the presidential office during Park Geun-hye’s tenure to win her support in establishing a court of appeals. The Seoul Central District Prosecutors’ Office has asked Yang to appear for interrogation on Friday. If he complies, Yang will be the first former top court chief to be questioned by the prosecution as a suspect. Prosecutors said they had obtained a statement indicating that Yang conveyed his opinion to Kim, saying that should the Supreme Court uphold the lower court’s ruling, Japan would take it to the International Court of Justice. Prosecutors questioned Kim late last month about whether and how Yang had interfered in the lawsuits filed against Nippon Steel & Sumimoto Metal Corporation and Mitsubishi Heavy Industries by victims of forced labor. The Supreme Court remanded the case to the Seoul and Busan high courts in May 2012 in favor of the plaintiffs. On remand, the Seoul High Court and the Busan High Court ruled for the plaintiffs in July 2013 on their respective cases. Nippon Steel and Mitsubishi appealed the decisions, and the cases awaited the Supreme Court’s final ruling for over five years before the top court ordered Mitsubishi in October last year to compensate the Korean victims. Yang’s position on the case corresponded with that of Park’s presidential office and the Foreign Ministry at the time. Prosecutors suspect that Yang received through the chief of the National Court Administration a request from Park’s office to reverse the lower court rulings, and that he presented his opinion to the judges handling the case.